I agree totally. The opposition is fake. Regardless of November's outcome, the U.S.A. will retain a government of-the-corporations, by-the-corporations, and for-the-corporations. I agree about third party, except Johnson, he's clearly been bought and sold already and is their backup plan. His endorsement of the TPP seals that for me. But I can't forgive Hillary her crimes. Or well I can't forgive the law not holding her accountable for them. Even if I manage to help stop her being elected I won't be happy. It's not just about the presidency, it's that I don't want us to become like the Philippines where the only way to fix the rule of law is through bloodshed. To me Hillary has become the test. If we can get her to pay for her crimes, there's still some hope we can get back the rule of law without violence. Also worth noting Trump is considered a con-man in business circles. I made a thread about it awhile ago, but I think I asked to have it deleted once the election started. I was more reserved towards the overall picture at the time. I made that thread after spending time with a international-financier, fraudster/conman, who explained his mentors, (someone closely related to Trump) & involved in dealings within that circle. To know the fraud, look at ACN, it's a pyramid scheme, MLM company that bilks high-school kids, promoting directly to them or anyone dumb enough to drop a couple hundred on "a licence", but it makes most its money on the licenses. They were for awhile feeling "video-phones" and energy and phone time. The real cash cow was in the licenses. Trump his circle, all of them, dishonest tricksters. 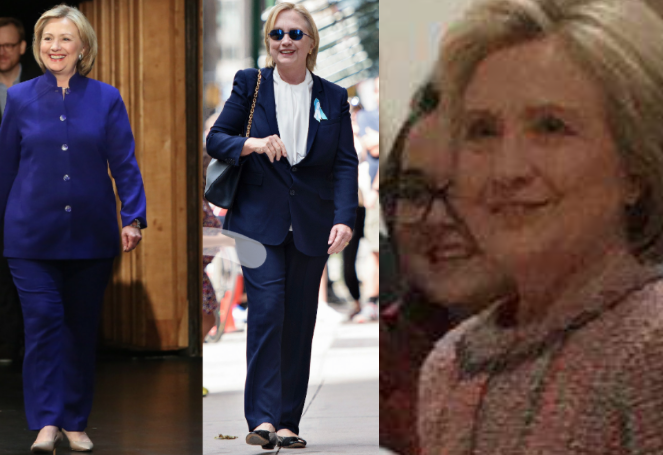 If you think this is an endorsement for Hillary, think again, I have a very high confidence Hillary is not even real, and by that I mean, on 9.11, we saw Hillary take ill. We saw a woman come out of the medical facility (aka:Chelsea's Condo -with no SS), and that person has made all HRC's appearances since. Don't be surprised if something prevents this charade from reaching a new 'elected' "President". look how young hillary looks in the photos. dont you think times change? Plus trump is a business man, he just keeping possible clients sweet at the time. Not that im endorsing him . In learning about true libertarianism, I had discovered that the Koch brothers were used to destroy that party back in the 70's, I agree with you 100% on him being a shill, his stance on mandatory vaccines sealed the deal for me, I had not seen the endorsement of TPP, not surprised. Hillary needs to be held accountable, this much is certain. However I could see them making her a martyr long before that would happen. If she was to get taken down the whole house of cards could come down as well... in truth this is what I hope Assange is able to do, bring down not just Hillary, but expose the whole damn system! I would love to see the whole house of cards get tipped over. I just don't think Assange has the power to do it, even if he had the goods. Too many people still rely on mainstream media. We understand that there are those among them that claim they are of the left and of the right, but in such a conservative country, I don't think they know what's left or right....well, at least G.W. certainly doesn't.